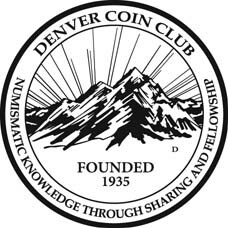 Welcome to the Denver Coin Club web site!! Visit one of our Club Meetings!! Information contained within is for informational purposes only. Some shows have not been confirmed. One should verify all information prior to attending. More shows Listed as they become available! If you have any changes, updated or further information on the listed shows above or other upcoming shows in the Colorado Front Range area, please contact turner_medals@yahoo.com.